Sorry these are so delayed, I just couldn't get motivated at home to getting writing a blog post! As many of you are aware I had a "surprise" Christmas project I was working on since August! I took pictures through instagram (@knotted_thread) but I never posted pictures because my dad reads the blog to keep up with me while i'm in Hawaii (how cute is he! 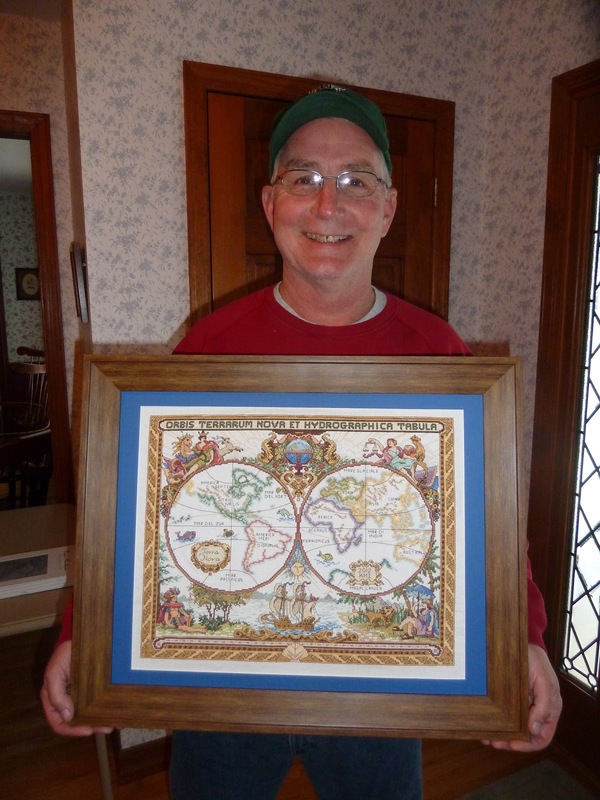 haha) Anyway, my roots are in counted cross stitch and my dad is an olde world map fanatic..
working consistently, basically everyday on it. I think he likes it..
never make it again, but i'm glad he liked it! Wow! That is quite a commitment. I'm a cross stitcher from way back too, and this makes me want to try it again--maybe. :) He looks so happy with it, so I'm sure it was worth it! Oh wow! The last big project I took on got abandoned and it was smaller than this! Of course that was like 4 years ago when I had 2 and 4 year olds running around, but still. I'm sure your Dad loved it--looks like it and I love that he reads the blog. Great job, Dad! Way to make your sweet daughter feel special!! Very very cool!! That WAS a labor of love but obviously so worth it! Awe, come on! One more? I know as a former cross stitcher how much time=love went into this project. So glad it was well received. You have SO much more patience than I do!!!! It is beautiful but there is no way in hell I would ever attempt it. I have the chart for that project. It's on my some day list. Wow, that is so cool! Good job. This is fantastic. 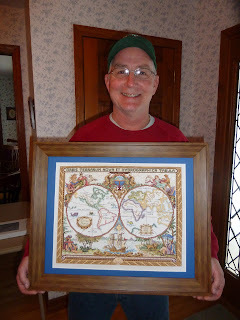 I love maps too and I have a print of this but may have to consider doing the cross stitch version. I love cross stitch! That piece came out beautifully!! Just stunning! All I can say is WOW. That is so amazing! You have incredible patience! Wow! A labor of love indeed! You Dad absolutely loves it I can tell from the pictures. You are a wonderful daughter. You did such an amazing job Jennifer and I loved seeing your progress pics on IG. I love the photos of your dad - wonderful. What a great gift, and so thoughtful! Your dad looks so happy with his gift, too! This turned out fabulously!! You did an awesome job - definitely a labor of love! My dad follows my blog too!